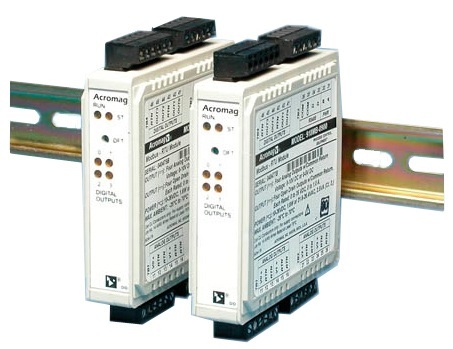 This signal conditioner is a four-channel analog input module with four discrete outputs designed to filter and linearize thermocouple inputs while providing isolation between input, output, power, and network circuits. – ±100mV DC input: 0.1%. – Thermocouple input: 0.1°C (0.18°F). – Better than ±0.005% of input span per °C, or ±1.0uV/°C, whichever is greater. – Normal mode: 40dB @ 60Hz, typical. – Common mode: 140dB @ 60Hz, typical. – Thermocouple type user-configured. Type selected applies to all channels. Signal linearization, cold-junction compensation, and open circuit or lead break detection are included. – TC sensor failure can be configured for either upscale or downscale. Selection applies to all channels. – ±0.1% of input range. – Four independent open drain MOSFET switches with a common return that operate as low-side switches. – 0 to 35V DC, 1A DC maximum for each output. – 4.1ms typical, from receipt of command to gate transition of the output MOSFET. The command/response protocol for communicating with this module adheres to the Modbus/RTU standard for the following Modbus Functions. LEDs indicate power, status, and discrete level/alarm. – 22 to 26V AC. 1500V AC for 60 seconds or 250V AC continuous. 4-way isolation between input, network, power and discrete I/O circuits. Inputs are isolated channel-tochannel for common mode voltage to ±5V DC. Optional terminal block kit, barrier strip style, 2 pcs. Optional terminal block kit, spring clamp style, 2 pcs.